Tammam Azzam will participate in a panel discussion at Next Generation London. The event is in correlation with a week-long exhibition titled Beyond Borders in aid of Unicef’s Children of Syria Emergency Appeal, and is hosted by BlainSouthern, a contemporary art gallery. The panel discussion will take place on 18 May at 6:30pm. A live auction of the exhibition’s works will take place on 19 May. 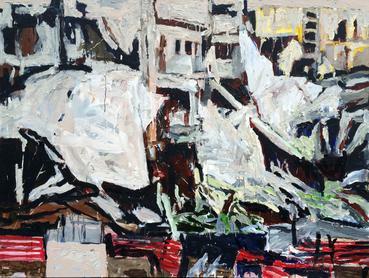 The benefit sale includes an example from Azzam’s recent Storeys series in addition to a painting by Athier Mousawi.